Reaching space is a dream of many Indians. These aspiring astronauts take their inspiration from Rakesh Sharma – the first Indian to travel in space. It is said that some read history and some create history. Rakesh Sharma, is one such Indian who created history for his nation. In this article we will look at how he started off his career in Indian Air Force and then moved on to become first ever Indian to complete the epic journey to the frontier beyond earth. Before we do so, let us take a quick look at his life in a tabular format. Now that we have looked at the highlights of his life, let us take a more detailed journey into his life. Ready? 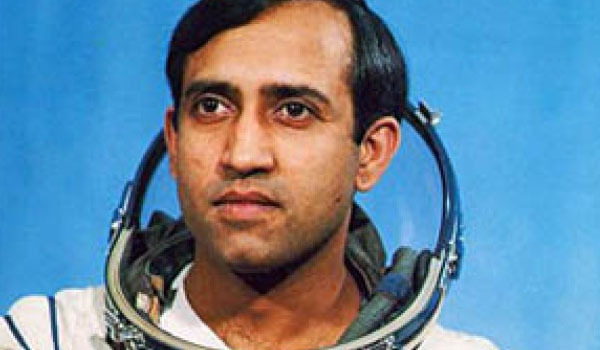 Rakesh Sharma was born in Patiala in Punjab, India on January 13, 1949. As a child, he completed his basic education from Hyderabad’s St. Georges Grammar School. After completing his schooling, he went to Nizam College in Hyderabad and earned a graduation degree. In 1966, when he was only 18 years old, he became an Air Force cadet. His good performance as a cadet earned him an entry as an Air Force plebe in National Defense Academy. This happened in July 1966. For next few years, Rakesh Sharma managed to show his dedication and extreme focus. Based on those grounds, the Indian Air Force commissioned him to become a pilot. In 1970, he became a test pilot in Indian Air Force. He was 35th National Defense Academy’s alumnus. In 1971, he started flying Russian-made MiG aircrafts. The full name of MiG is Mikoyan-Gurevich. He excelled in his job and soon started moving up the ladder and became Indian Air Force’s pilot and Squadron Leader in year 1984. However, before he became a Squadron Leader, in 1982, he was shortlisted to be a cosmonaut. This shortlisting happened on September 20. ISRO or Indian Space Research Organization teamed up with Soviet space program called Intercosmos for a joint space programme. April 3, 1984 – it was a historic day for both India and Rakesh Sharma. The spaceflight Soyuz T-11 took off with three cosmonauts. Two of them were Russians and the third person was Rakesh Sharma. Soyuz T-11 took the three cosmonauts to the space station named Salyut 7. There, Rakesh Sharma and the two other Russian cosmonauts spent 8 days travelling in Earth’s orbit. Sharma was given the task of photographing India’s Northern Parts. The multi-spectral images he was supposed to capture would be used for constructing Hydroelectric Power Station close to the Himalayan Ranges. He did what he was asked to do and then returned safely to earth. Sharma was interviewed by press where he disclosed that being in space was the best feeling he ever had in his entire life and that in order to be there, he had to undergo rigorous training. Those training programs included zero-gravity training as well. With Rakesh Sharma going to space, India became the 14th nation in world to have sent a cosmonaut in outer space. A few years after becoming first Indian to go to space, Rakesh Sharma retired from Indian Air Force. He left as a Wing Commander. After retirement, HAL or Hindustan Aeronautics Limited hired him as test pilot. He was posted at Nashik Division of HAL. From there, Sharma moved on to NFTC or National Flight Testing Center located in Bangalore. At NFTC, he started working on LCA programme. LCA stands for Light Combat Aircraft. In 2006, an ISRO conference took place where ISRO scientists gathered. Rakesh Sharma was invited in the conference and was made responsible for overlooking one of the space programs of India. He has now retired from all his services. Becoming India’s first person to go in outer space is an achievement in itself. However, in order to honor his achievements, Government of India awarded him with “Ashok Chakra”, which is India’s highest gallantry award during years of peace. The two Soviet cosmonauts were also awarded with Ashok Chakra. Similarly, Soviet Union awarded Rakesh Sharma with the title, “Hero of the Soviet Union”.